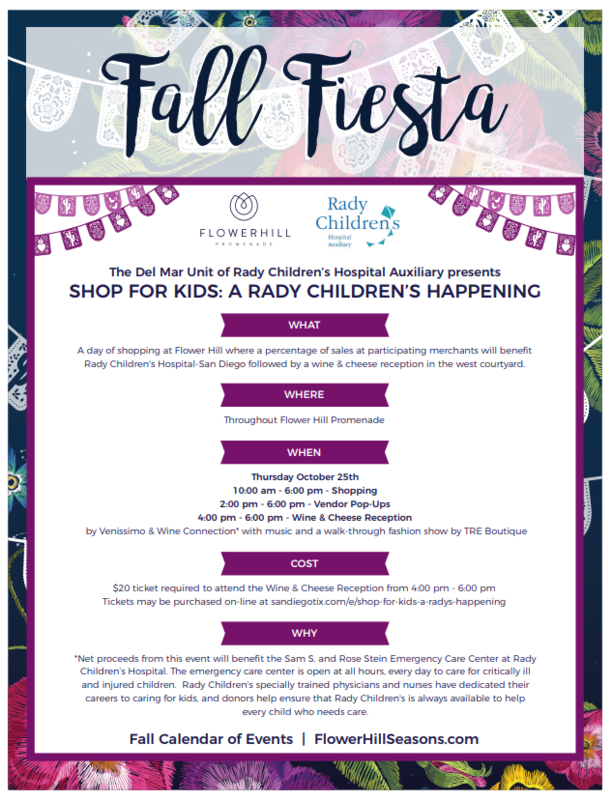 Rady Children's Hospital Auxiliary Del Mar Unit is hosting a day of shopping at Flower Hill Promenade on October 25th from 10am to 6pm. We will host a wine and cheese reception and fashion show at the end of the shopping day from 4:00 to 6:00 p.m. in the Promenade. Enjoy wines from the Wine Connection and cheese from Venissimo, along with a TRE Boutique fashion show. Mingle with friends, taste some wonderful wine and cheese and help raise funds for San Diego, Rady Children's Emergency Room! Gather with friends for a chance to shop the beautiful boutiques at Flower Hill Promenade between 10:00 am and 6:00 pm. Then join us for a private Wine and Cheese Reception with wines courtesy of The Wine Connection that will complement the exquisite cheeses from Venissimo Cheese Shop. Enjoy an informal fashion show by TRE Boutique, take your chances on a fun opportunity drawing and enjoy some musical accompaniment. Funds will be raised for the Rady Children's Hospital Sam S and Rose Stein Emergency Department. Purchase your tickets to the Wine and Cheese Reception here, or if you aren't able to join us you can add a donation on the ticket purchase page. © Copyright San Diego Tix 2019 - All Rights Reserved.